I love this book. It is a showcase of four decades of Melbourne community radio station 3CR — one of Australia's oldest and most progressive broadcasters, intertwined with the local and national landscape of political struggle from the mid 1970s until today. Page after page of informative, entertaining stories make for great reading. 3CR started broadcasting in 1976. Acknowledged at the time as Australia's first community owned and run station, it drew on the experience of anti-war activists in the late 1960s and early '70s. This included activists involved in a pirate radio station operating out of Monash University. 3CR's purpose was to provide a voice for the community “as a counter to the inaccessible, conservative and commercialised outlets that dominated Australia's media environment”. This is a role the station still plays today. 3CR won its broadcast license following an opening up of the airwaves to public access that was carried out by Gough Whitlam's Labor government. Thrown into uncertainty after Whitlam's 1975 sacking, the station eventually received its restricted licence with literally minutes to spare before transmission started. The Community Radio Federation (CRF), the station's governing body, is unique. Made up of affiliated groups (who can vote and can access airtime), listener sponsors and station worker-elected reps, it has provided 3CR with a democratic structure. This has enabled the station to survive for 40 years and withstand repeated political attacks from government and conservative interests alike. These battles are recounted through the book. One early battle, in 1978, was in defence of 3CR's programs Palestine Voice and Palestine Speaks against opposition from the Victorian Jewish Board of Deputies. This led to the launching of an inquiry by the Australian Broadcasting Tribunal (ABT) into whether 3CR's license should be revoked or suspended on the grounds that it had broadcast “offensive material”. The Bulletin even tried to scandalise 3CR as “the voice of terrorism” on its front cover. 3CR survived this attack, as well as surveillance by police and ASIO (some of which was revealed when the station's 10-volume ASIO file became available last year). The book colourfully portrays 3CR's role as the voice of struggle as told by the range of community programmers, activists, including trade unionists, who have been a part of the station since its inception. Volunteers from the Victorian branch of the Builders Labourers Federation were early programmers on The Concrete Gang — a show produced by unionists in the building industry that can still be heard on a Sunday morning. Programmers adopted aliases to avoid being blacklisted by the Master Builders Association — a tradition that continues to this day. 3CR's industrial reporting remains pivotal in building solidarity with workers struggling for their rights — from the attacks on the BLF and Victorian Nurses strike in the 1980s, to the 1998 MUA dispute and the 2012 Baiada Poultry workers campaign. Many stories from these campaigns, including the historic MUA picket line at Webb Dock, are told by station workers and volunteer broadcasters, who camped out on picket lines and presented shows such as The Stick Together Show and On the Picket Line. First Nations, Aboriginal and Torres Strait Islander broadcasters on 3CR have a significant presence in the book. This reflects the station's commitment to sovereignty and a treaty, as well as the range of programs and campaigns it has supported over the years. Ethnic community broadcasting took off in Australia in 1975 when communities were first given the chance to broadcast in their own languages. 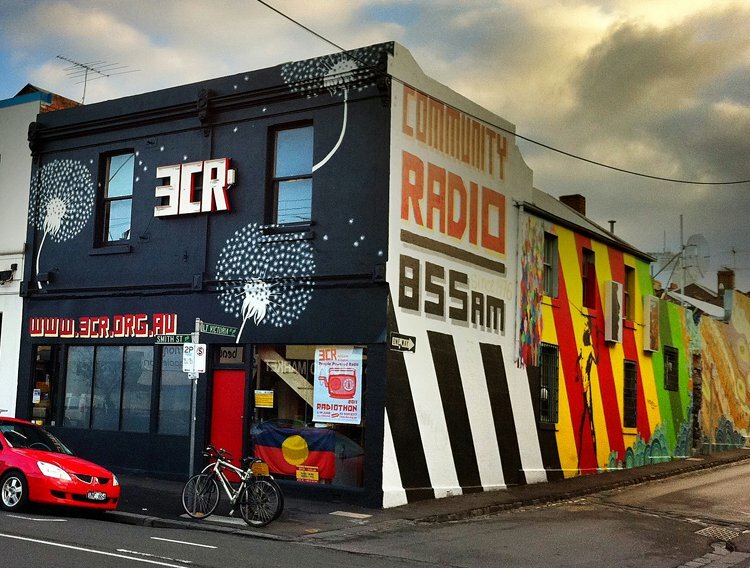 The station's location in Fitzroy, in the heart of Melbourne's Greek community, soon led to 3CR welcoming progressive Greek broadcasters and expanding ethnic broadcasting in the years before SBS came on the scene. As the book outlines, 3CR gives voice to many diverse communities marginalised in mainstream media. These include prisoners and their families, people with disabilities, the LGBTIQ community, homeless people and young people. Representatives of each sector tell their story of how they became broadcasters — some by happy accident or being invited onto a show for a chat. Thanks to 3CR's training programs, hundreds of activists have acquired broadcasting and other skills they would never have imagined before they stepped through its doors. East Timor Calling, which first aired in 1977, advocated for freedom and independence for the East Timorese people at a time when not much was known in Australia about the brutal invasion and occupation by Indonesian forces. Content came in the form of letters and personal accounts smuggled out of occupied Timor, and via clandestine radio communications from the resistance movement in East Timor. 3CR's internationalism continues with shows produced by Melbourne's Tamil, Eritrean and West Papuan communities. The station's commitment to supporting local and live music is also a feature of the book. From live-to-air performances to station fundraisers, 3CR has helped many new bands find an audience. The book celebrates 3CR's commitment to the participation of women from early shows such as Alive and WEL, to programs such as Accent of Women, Women on the Line and Voice of Arabic Women. The station has continued to champion women's rights and women's voices, and 3CR pushed the boundaries with an affirmative action program to only train women sound technicians. Environmental and anti-nuclear campaigns have used the airwaves effectively throughout 3CR's history. For instance, The Radioactive Show interviewed peace and anti-nuclear activists from around the world. The station also featured on-the-spot coverage of the victorious Franklin Dam blockade and the campaign against mining in Kakadu. Shows such as Earth Matters were born out of this activist broadcasting. 3CR has been able to remain at the forefront of social movements across Melbourne and beyond, and survive and expand, thanks to the support of its listeners and the dedication and hard work of station workers, activist broadcasters and thousands of volunteers. The book is full of stories and memories. It also contains important lessons for activist journalists and those committed to building the power of progressive media against the corporate-controlled “infotainment” that dominates the Australian media. Buying a copy of this book will help ensure that 3CR's important contribution to people powered media and the movements for social change continues for many years to come. Tune into 3CR from anywhere in Australia.